Statistics section represents those facts of your knowledge base which can be stated in numbers, in any tabular form or in a classified arrangement. PHPKB provides you to monitor the quality of all the contents you produce through review metrics. Statistics section is categorized into several subsections to provide in-depth statistics of various knowledge base components such as articles, categories, users, search traffic & failed login attempts. Reports are available in the form of interactive charts (for graphical analysis) as well as in tabular (print-friendly) formats. 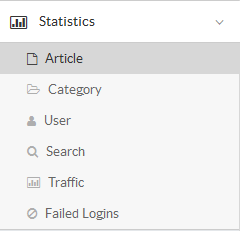 Superusers can click on "Statistics" section in the left navigation bar to view different reports. When you click on any of the subsections of ’Statistics’, corresponding page with tabs of different statistics reports will display. For example, if you click on Articles, the page will display different tabs like summary, popular articles, top rated etc. Similarly, all other sub-sections will display tabs of their statistics reports which are explained in different articles. In the multi-language edition of PHPKB knowledge base software, by default English statistics is loaded but statistics of other languages can be seen by changing the language from the language drop-down available on right side of the screen. The language drop-down is not available in non-ML editions of software.